Yes, we get it. Internet is everywhere and so are your users - prospects and clients. Clearly, you can no longer afford to ignore that "international-time zone-user-set". Especially, in such cases, communicating with users across different timezones is a key challenge. More than often marketers not paying heed to this, end up irritating customers. End result - user churn. It is for this reason, understanding your audience is extremely critical. There is fair amount of sensitivity attached to receiving notification on the wrong time - we help you take cognisance of that. Your business might be operational from New Delhi, India, but we are sure you have worked hard to get users at a global level. Well, you did a great job. Now it is the time you start reaching out to those users and tell them how awesome you are. Just make sure you do not bother some of them at 3 am with your notification which was actually scheduled for 10 am according to your time zone. 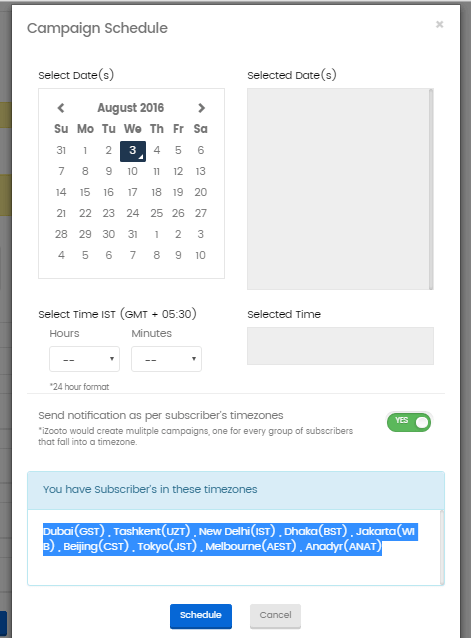 With iZooto's 'Campaign Scheduler', you may now choose to send notifications according to your subscribers' timezones. Make sure that your subscribers get notified exactly when you want them too, not a minute early, not a minute late. 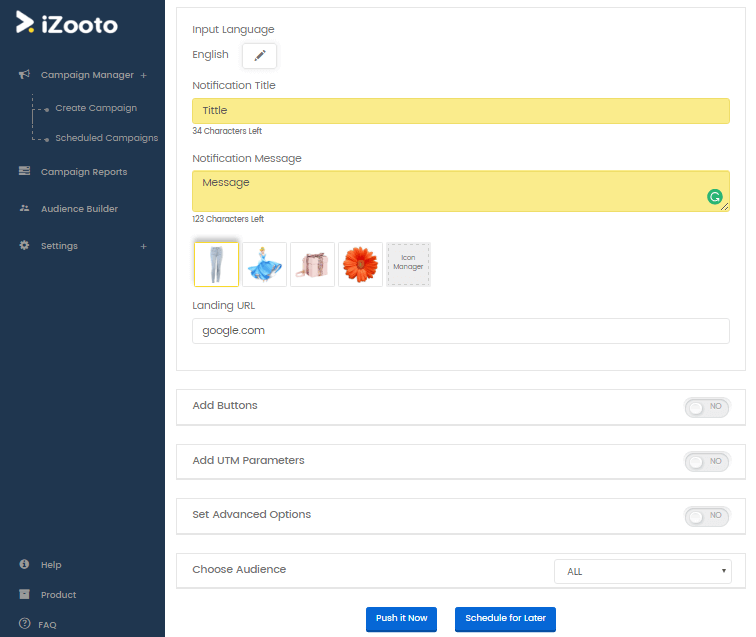 iZooto's 'Campaign Scheduler' will now enable you to customize your notifications according to your subscribers' time zones. Now you can schedule the same notification for 10 am IST and still be sure that even all the global subscribers will receive your notification at 10 am as per their time zone. 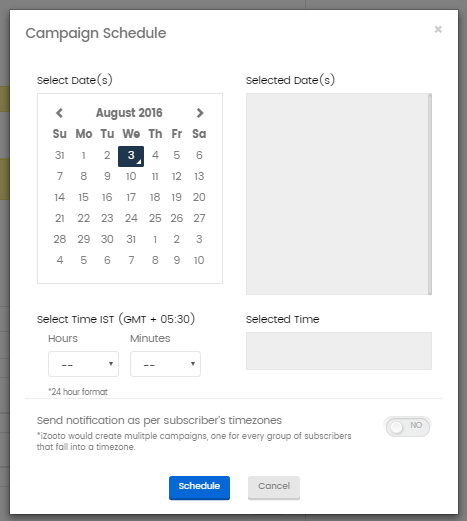 Once you create a campaign and schedule it according to the subscriber's time zone, separate campaigns get created automatically for all the including time zones. You can then modify and edit each campaign as per your requirement. For the campaign reports, you can log in to the dashboard and click on 'Campaign Reports' on the left sidebar. The campaign reports now be seen with two filters - audience and the timezone. It will help you analyse your campaign performance with respect to different geographies and time zone. Now you know, subscribers from which geographical region are responding towards your notifications and hence you can customize your campaign accordingly. Step 1 - Login to your iZooto account to access the dashboard. You will see the entire lists of timezones your subscribers belong to. 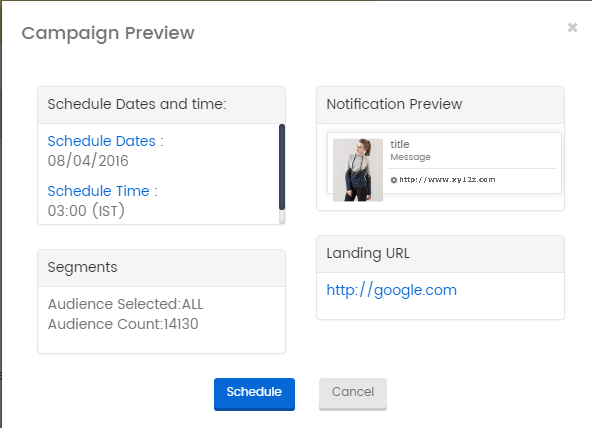 You can edit each campaign according to your requirement and get started. Next time you are posting content, take a minute to think who would be most interested in what you are posting – and schedule your post taking care of the subscriber's time zone so that you can make sure you are reaching the right people at the right time!